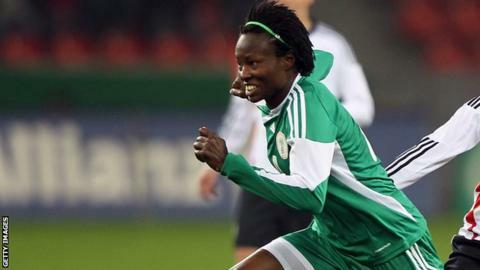 Nigeria legend Perpetua Nkwocha admits she is unlikely to play another African Women's Championship - but has told the BBC it would be her "dream" to coach the Super Falcons in the future. On Saturday she helped Nigeria win their 7th African Women's Championship here in Windhoek - coming off the bench in the final minutes of their 2-0 win over Cameroon. The 38-year old concedes that her international career will be over by the time of the next AWC, in Cameroon in 2016, which is why she is looking to the future. "My dream is to encourage the young ones, to tell them [that] if they have talent for football, they need someone who can encourage them," the four-times African footballer of the year told the BBC. And she is especially happy to hand over the striking duties to the new young partnership of Desire Oparanozie and Asisat Oshoala - respectively the top scorer and player of the tournament in Namibia. Especially Oshoala, top scorer at the Under 20 Women's World Cup earlier year - who reminds many Nigeria fans of the young Perpetua Nkwocha. "When I watched Asisat in the U20, I got a lot of messages saying - 'we've found another Perpetua! '," Nkowcha said. "I watched her play and I was so happy - I tried to encourage her more, especially in this competition. "I told her 'you have to show the whole world - you went to the Under 20 and you did it, now you have to come to the senior team and do it' - and she made me proud." Whilst admitting she won't be in Cameroon in two years' time, Nkwocha didn't rule out making it to one more Women's World Cup, in Canada next year. "This will be my last AWC, but for the World Cup - I don't know yet. When the times comes [to make a decision] I'll signal the whole world to know," she said - as the Super Falcons gathered to head to the airport in Windhoek. Depending on which set of statistics you use, Nkowcha has been in the winning squad of either five or six African Women's Championships. Her playing time may well be coming to an end but - if she has anything to do with it - her influence on Nigerian women's football is set to be felt for a long time to come.